There are two main distillery processes, dry-milling and wet-milling. Dry-milling (or dry-grind) is the main process for producing ethanol. This process starts with grinding before steeping the grain in water, and results in ethanol and various by-products. In the wet-milling process, the grains are steeped and the kernels are separated into various fractions, which allows for the production of multiple food and industrial products, including starch, proteins, fructose, oil and ethanol. This process, which runs non-stop for months, yields higher amounts or ethanol than dry-milling and saves costs, labor and yeast (Graybosch et al., 2009). It results in numerous by-products including wheat gluten meal (sometimes called vital gluten), wheat gluten feed and wheat germ meal. These by-products account for 25-30% of the ethanol value chain turnover (Graybosch et al., 2009; Cozannet et al., 2009b). While official and trade definitions exist for the different wheat distillery by-products, the boundaries between these products may be somewhat fuzzy. In particular, the amount of solubles blended back to the distillers grain can be highly variable (Newkirk, 2011) and the presence of solubles unspecified in nutritional studies. However, it can be assumed that the majority of sold wheat distillers grain are actually wheat distillers grain and solubles. 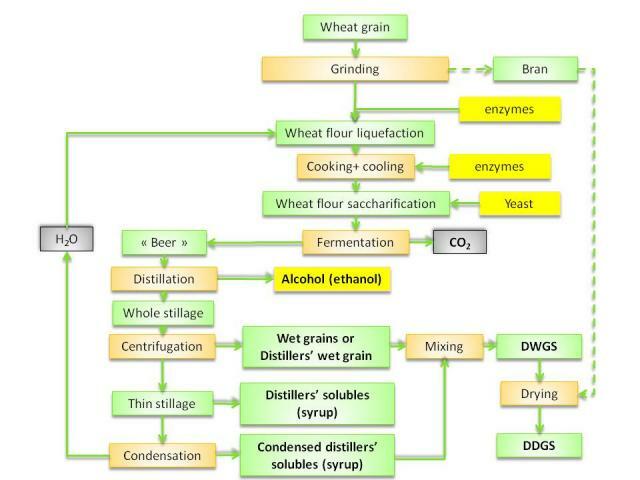 This datasheet deals primarily with the DDGS of wheat-based, dry-milling ethanol production (Graybosch et al., 2009). The availability of DDGS has grown considerably since the 1990s, due to the increasing demand for biofuel caused by environmental concerns and subsequent regulations. In Europe, EU Directive 2009/28/EC set a target of a minimum 10% share of energy used for transport from renewable sources for each Member State in 2020 (European Union, 2009). In the USA, E15, a transportation fuel containing 15% volume of ethanol and 85% gasoline has been authorized and available since 2001 (RFA, 2013). While the USA mainly fulfil their needs with maize-based ethanol, wheat is the primary feedstock for biofuel in Europe, Canada and Australia (Moreau et al., 2011; Newkirk, 2011). Wheat distillery by-products, such as wheat distillers, are thus mainly produced in those regions (Piron et al., 2009). While the dry milling process yields DDGS as the main by-product, the wet milling process provides high value products such as gluten (used in the baking industry and as an emulsifier or thickener), bran (used in cereal foods), germs (used in bakery products and for some high value cosmetic uses) and flour (Tibelius et al., 1996). Distillery by-products have a long and rich history in animal feeding. They used to be considered offals and were dumped in sewers and rivers. Spent grains were sold at a low price to local farmers as animal feed (Lyons, 2003). The first study on feeding distillers grain to cattle was published in 1907 (Weiss et al., 2007). Wheat distillers grain is a valuable feed ingredient, usually richer in protein than maize distillers grain, lower in fat and higher in fibre, and can be fed to most classes of livestock (Hayes, 2008). Like maize DDGS, wheat DDGS was first used in ruminant feeding, but, due to its higher availability and a better knowledge of its nutritional value, it is increasingly used for non-ruminants, especially pigs (Newkirk, 2011; Stein et al., 2009; Cozannet et al., 2009a). Wheat distillers grain may be used as fertilizer as it is an effective and slow-release source of N, P and other nutrients (Schoenau, 2011). Wheat ethanol production used 6.3 million t of wheat worldwide in 2010, an amount that is expected to reach 15 million t in 2020 (OECD-FAO, 2013). Assuming that 1 t of wheat processed into ethanol yields about 372 L of ethanol and between 295 and 400 kg DDGS (10% moisture), worldwide wheat DDGS production was about 1.9-2.5 million t in 2010 and will reach 4.4-6 million tons by 2020 (Désialis, 2013; Bonnardeaux, 2007). In 2010, France and Canada were the main producers of wheat DDGS with 0.56 and 0.5 million t respectively (OECD-FAO, 2013; Marouby et al., 2009). In the first step of the dry-milling process, the grain is either ground or milled to produce bran-free flour. The ground grains or the flour are then mixed with water and enzymes (amylases) to produce a mash where starch hydrolysis occurs (liquefaction step). This mash is cooked to kill the bacteria that produce undesirable lactic acid. Enzymes are added to the mash to transform starch into dextrose (saccharification step). After saccharification, yeast is added to start the fermentation process, which produces a "beer" and CO2. The beer passes through a continuous distillation column to yield alcohol at the top of the column. The product that remains at the bottom (whole stillage) is centrifuged and yields wet grains (also called spent grains) and thin stillage. If the bran has been removed from the grain prior to fermentation, it may be added to the wet grains. With some processes, fats and fibre are removed in the early steps of the process and protein is concentrated in the final distillers dried grain, which is then called high protein distillers grain (HPDG) (Newkirk, 2011). Wet grains may be fed to livestock directly or they can be dried to produce dried distillers grain (DDG). Thin stillage can be sold as high-moisture feed, or it can be dehydrated to produce condensed distillers solubles (CDS, also called syrup). Condensed distillers solubles and distillers grain are often blended together to prepare wet or dried distillers grain and solubles (WDGS or DDGS) (Newkirk, 2011). When the bran is added back at the end of the process, the distillers grains contain more starch. In addition to ethanol, the fermentation process produces 3% of yeast and 4% of glycerol (Hazzledine, 2008) that may be recovered in the DDGS residue and affect its composition. While dry-milling ethanol manufacturing follows the process described above, the nature of the end products (beverages, industrial alcohol, biofuel), local know-how and innovation require specific adaptations, resulting in by-products of variable composition. It should be noted that, as of 2013, wheat ethanol by-products are still evolving due to changing technologies and biofuel demand. Wheat is the main feed material in certain whisky distilleries (Crawshaw, 2004). The mash is filtered after the liquefaction step, producing wort and a solid by-product called draff or distillers spent grain. The wort undergoes further fermentation while the draff is dried or pressed before being fed to animals. The alcohol-free effluent that remains at the bottom of the distillation column is called spent wash or spent lees. This product, which contains enzymes and yeast, can be dried to yield dried distillers solubles. Wheat distillers solubles contain xylans and arabinoxylans that are not broken down during the process and result in a high viscosity level in the solubles. Wheat solubles are, therefore, more difficult to dry than maize solubles (Crawshaw, 2004). Wheat solubles can be centrifuged so that the solids can be further dried into distillers concentrate. As in ethanol production, the spent grains are often mixed with the solubles, resulting in wheat distillers dark grains (Crawshaw, 2004). It is important to note that whiskies are often the result of the distillation of blended grains that may include maize, wheat, barley and rye. The by-products are, therefore, not wheat distillers in the strict sense. Single malt whisky is usually made from barley (and sometimes rye) (Crawshaw, 2004). In some distilleries of Scotland, where wheat is the sole feed material for whisky, the nutritive value of wheat distillers dark grains is significantly higher than that of malt distillers dark grains (Crawshaw, 2004). Drying wheat distillers grain and solubles has a high energy cost since the drying process may consume 35% of the thermal energy used in an ethanol plant. However, wet distillers grain spoils quickly and the dried form is preferable despite the energy cost (Murphy et al., 2008). Drying distillers grain produces volatile organic compounds that may cause serious health problems. These emissions can be reduced by low temperature drying units in ethanol plants (Bühler, 2013). Wheat distillers grain fed to livestock removes huge amounts of by-products that would otherwise have to be eliminated by other means (Lyons, 2003). Maize distillers grain has been shown to decrease methane emissions produced from enteric fermentation by 3.2 g CO2eq/MJ ethanol per head of cattle (US EPA, 2010). This reduction is mainly due to the high fat content of maize distillers grain (Grainger et al., 2011). Because wheat DDGS is lower in fat content (only 4-5 % DM), the reductions of CH4 emissions are likely to be lower for wheat DDGS than for maize DDGS (Grainger et al., 2011). Wheat DDGS is rich in protein, which ranges between 30 to 40% DM, similar to rapeseed and sunflower meals and slightly higher than for traditional (not high protein) maize DDGS. Wheat DDGS has low concentrations of starch and soluble sugars. When the whole grain is used in fermentation, the final starch content of the DDG is about 4.5% DM. When the bran is removed before fermentation and added back at the end of the process, the starch content tends to be much higher (10-25% DM) with a large variation. The NDF content of wheat DDGS is also variable: wheat DDGS from whole grains have a slightly higher NDF content than wheat DDGS from milled grains (32 vs. 27% DM). The fat content of wheat DDGS is low (5% DM) and less than half that of maize DDGS. Because wheat solubles are high in fat (up to 34%) and low in NDF, the more solubles that are added to wheat DDGS, the higher the fat and the lower the NDF content of the distillers grain (Newkirk, 2011). The composition of wheat DDGS is much more variable than in the original grain. In addition to the variability inherited from the grain itself (cultivar, growing conditions), there are large differences between ethanol plants due to: the method of grain preparation (grinding or milling); the fermentation process (type of enzymes and yeast strains); the amount of soluble fractions (richer in protein) blended with distillers grains; the duration and temperature of drying; and to possible further fractionations (separation of proteins, etc.) of the non-starch fractions (Cozannet et al., 2010a; Kalscheur et al., 2012; Newkirk, 2011). As noted above, the reintroduction of bran at the drying stage results in a product containing more starch and less fibre. Adding more solubles increases the fat content and lowers NDF (Newkirk, 2011). The blend of different raw materials also contributes to the final DDGS. In some ethanol plants, wheat is blended with maize before distillation, which modifies the protein, phytate and energy contents of the final product (Newkirk, 2011). Another source of variability is the heat damage occurring during the drying process. Wheat DDGS that have undergone high processing temperatures will have a reduced protein degradability in ruminants and amino acid availability in monogastrics. Depending on the composition, and more importantly on the drying process, the colour of wheat DDGS can vary from light yellow to dark brown. For instance, the luminance (L) values of 10 European wheat DDGS ranged from 43 (black products) to 63 (yellow products) in the study of Cozannet et al., 2010c. These authors suggest that wheat DDGS with L values lower than 50 have been overheated with a high occurrence of Maillard reactions. As DDGS become darker under high temperatures, light-coloured wheat DDGS should be preferred for monogastrics as their amino acid content and availability might be higher (Noblet et al., 2012). The amino acid profile of wheat DDGS is partly similar to that of the initial grain. However, yeasts used for starch fermentation represent an additional protein source equivalent to about 5% of the total DDGS protein content (Ingledew, 1993). In addition, the level of soluble fractions added into distillers grains may be variable and influence the protein content and the amino acid profile. Despite these potential sources of variability, the amino acid profile is quite comparable in wheat and wheat DDGS, except for lysine and arginine contents, which are lower for wheat DDGS. The lysine and arginine levels in the crude protein are highly variable, even in light-coloured products: 1.7 to 3.0% and 3.7 to 4.6%, respectively, in the study of Cozannet et al., 2010a. Unlike wheat or its milling by-products, poor correlations exist between lysine/arginine contents (when expressed in % DM) and the crude protein content, such that the latter cannot be used as a single indicator of lysine or arginine levels in wheat DDGS (Noblet et al., 2012). Minerals are three times more concentrated in wheat DDGS than in wheat grain. Phosphorus is less bound in phytic acid than in the wheat grain, and is more available to pigs and poultry. Due to the use of sulphuric acid in the manufacturing process, ethanol by-products may be high in sulphate (0.5-1.7% DM) (McAloon et al., 2000), which increases the risk of sulphur toxicity in livestock fed large amounts of distillers grain. A high concentration of H2S inhibits the oxidative processes in nervous tissue and results in a central nervous system disorder called polioencephalomalacia, which may affect up to 6% of cattle fed diets containing more than 0.56% sulphur (Gould, 1998; Vanness et al., 2009). Wheat intended for ethanol production should be free of ergot, fusarium and vomitoxin. These impurities do not break down in ethanol production and can be concentrated approximately threefold in the DDGS (Newkirk, 2011). Some traditional whisky distilleries use copper stills and pipework (rather than stainless steel), and their by-products tend to contain high levels of copper, which is toxic to sheep. Maize distillers dark grain, for instance, may contain between 15 and 120 mg/kg of copper. Since copper content and biological copper availability are highly variable in whisky by-products, it is essential to check copper levels before buying such products if they are to be fed to sheep (Lewis, 2002). Copper is not an issue in industrial ethanol production. Wheat distillers are a good source of energy and by-pass protein for ruminants. In the INRA-AFZ tables, the ME content of wheat DDGS varies between 12.5 (starch less than 7% as fed) to 13.1 MJ ME/kg DM (starch over 7% as fed) (Sauvant et al., 2004). The digestibility of dried distillers grain and solubles (DDGS) from wheat and wheat/barley mixtures was 76, 50 and 87% for organic matter, crude fibre and crude fat, respectively, resulting in an ME of 12.1 MJ/kg DM, and an NE for lactation of 7.3 MJ/kg DM (Losand et al., 2009). Indigestible NDF is the major parameter determining OM digestibility. An in sacco study reported that wheat DDGS had 12% DM of indigestible NDF, similar to that of rapeseed meal (12% DM) and cottonseed meal (10% DM) but much higher than that of maize DDGS (5% DM) and soybean meal (almost zero) (Chapoutot et al., 2010). In a comparative study, rumen degradability of NDF was highest for rye distillers grain (47%), intermediate for wheat and triticale distillers grain (45%) and lowest for barley distillers grain (34%) (Mustafa et al., 2000). Though wheat DDGS is not reported to induce digestive interactions, the supplementation of wheat DDGS to a barley-based finishing diet reduced OM digestibility values, with no effect on DE content (Walter et al., 2012). In a comparison of different grains as ethanol sources, the effective protein degradability of wheat DDGS (54%) was found to be similar to that of rye DDGS and triticale DDGS (54 and 51%, respectively) and significantly higher than that of barley DDGS (49%). The protein degradability of thin stillage derived from wheat (60%) was lower than that of thin stillages derived from rye or triticale (59 and 53%, respectively), but higher than that of thin stillage from barley (48%) (Mustafa et al., 2000). Wheat DDGS are, with maize DDGS and soybean meal, one of the best sources of by-pass protein, better than all other untreated oil meals (Nuez-Ortin et al., 2010). In a meta-analysis of a database of in situ protein degradability, wheat DDGS was reported to have an effective protein degradability (for a transit outflow rate of 6%/h) of 56±5% (n=12). This value was lower than that of rapeseed meal (73±6%, n=3) and corn gluten feed (70±6%, n=9), but similar to that of soybean meal (59±5%, n=8) and higher than that of maize DDGS (46±4%, n=14), dried brewers grains (43±6%, n=4) and formaldehyde-treated soybean meal (33±9%, n=2) (Chapoutot et al., unpublished). Wheat DDGS are also a good source of rumen degradable protein: wheat DDGS supplementing a barley-based finishing diet increased linearly rumen NH3-N concentrations and N excretion (McKeown et al., 2010a; Walter et al., 2012). The apparent digestibility of protein in the small intestine (determined by a mobile nylon bag technique, Yue Qun et al., 2007), of wheat DDGS was reported to be 90%. This value was lower than that of soybean meal or groundnut meal (96%), similar to that of corn gluten meal (91%) and maize (90%), but higher than that of cottonseed meal (81%), rapeseed meal (82%) and brewers grains (74%), and much higher than that of alfalfa hay (40%) and maize straw (36%). The INRA-AFZ tables (Sauvant et al., 2004) and the meta-analysis of Chapoutot et al. 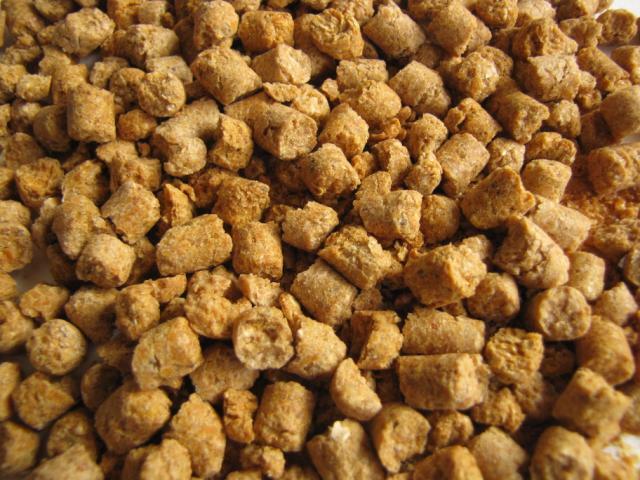 (unpublished) reported the following values of apparent digestibility of protein in the small intestine: wheat DDGS (85 and 93%); maize DDGS (90 and 93%); soybean meal (96 and 98%); cottonseed meal (90 and 86%); and rapeseed meal (79 and 70%). It can thus be considered that by-pass protein of wheat DDGS has a good intestinal digestibility and is one of the best sources of metabolizable protein. It must be noted that the by-pass protein of wheat DDGS is poor in lysine, like that of other distillers grains, which could limit performance in certain situations. One study (Nuez-Ortin et al., 2010) reported that a wheat and maize blended DDGS was a better source of truly digested and absorbed protein in the small intestine than wheat DDGS and maize DDGS separately. It has been shown by an in vitro incubation study that wheat DDGS diets produced more microbial N and microbial DM than control and maize DDGS diets. However, this difference was too slight to affect growth in lambs (O'Hara et al., 2011). The same effect was observed in cattle (Li Chun et al., 2012). Increased P excretion by heifers fed wheat DDGS at 20 or 40% of dietary DM presents a challenge for cattle feeders with respect to nutrient balancing (Walter et al., 2012). This is in accordance with results observed in growing lambs (McKeown et al., 2010a). Growing and finishing cattle are the major users of wheat DDGS, particularly in Canada (Newkirk, 2011). Increasing levels of wheat DDGS linearly increased DMI and reduced gain:feed ratio, but had no effect on average daily gain (Gibb et al., 2008). Wheat DDGS had a similar feeding value to barley when included at 20% (diet DM), but digestibility and energy content declined with higher levels of inclusion (Gibb et al., 2008). Replacement of barley grain with maize or wheat DDGS up to 40% (diet DM) led to higher performance (improved gain:feed ratio) with no detrimental effect on carcass yield and quality in heifers (Walter et al., 2012). Similarly, growing beef cattle could be fed on wheat distillers grain replacing barley grain without compromising feed conversion efficiency (Holtshausen et al., 2011). In steers, there was no difference in DMI or efficiency of gain in a basal diet supplemented or not with wheat thin stillage. Carcass traits indicated a trend towards increased fat with increasing thin stillage DM concentration (Walter et al., 2012). In another trial carried out with steers, there was a linear improvement in apparent digestibility of energy of the diet as thin stillage DM concentration increased. It was concluded that supplementing growing and finishing cattle with wheat thin stillage reduced the amount of the basal diet required for gain (Fisher et al., 1999). In heifers, a straw + ground brome hay based diet supplemented with either wheat DDGS, soybean-canola, or grain-canola did not alter intake, passage rate or digestibility. More study is required to assess the feasibility of feeding these supplements at greater levels with forage-based beef cattle diets (Kerckhove et al., 2011). Feeding triticale DDG to beef cattle did not affect carcass and meat quality but it increased n-3 fatty acids and reduced trans-fatty acids contents in the meat (He et al., 2012). Moderate amounts of wheat DDGS were used to replace both barley grain and silage to meet energy and fibre requirements of finishing cattle. However, when silage content was very low (under 10%), wheat DDGS was not an efficient fibre source and it decreased rumen pH even though the rapidly fermentable starch content of the diet was considerably reduced (Li et al., 2011). When barley grain was replaced with wheat DDG and maize DDG in diets fed to growing beef cattle feeding behaviour and incidence of rumen acidosis were unchanged (Holtshausen et al., 2011). Increasing the inclusion rate of wheat DDGS in a barley-based finishing cattle diet resulted in decreasing rumen propionate levels, whereas butyrate level increased (Walter et al., 2012). Replacement of barley grain with up to 40% wheat or maize DDGS did not mitigate rumen pH conditions associated with mild to moderate acidosis in heifers fed a barley-based finishing diet (Walter et al., 2012). Because of its protein content, wheat DDGS can be used as a substitute to rapeseed meal and even sometimes to soybean meal. Studies have shown that this substitution does not affect rumen fermentation, microbial protein production and milk yield (Azarfar et al., 2013; Abdelqader et al., 2013; Chibisa et al., 2012; Franke et al., 2009; Penner et al., 2009). The partial substitution of dietary concentrates with wheat DDGS does not generally affect milk yield, milk composition or chewing activity (Penner et al., 2009). However, when wheat DDGS was used as a forage substitute, it did not promote chewing activity to the same extent as barley silage, resulting in reduced milk fat concentration and a higher risk of rumen acidosis (Penner et al., 2009). Partially replacing barley silage with wheat DDGS was able to improve productivity of lactating dairy cows, but decreased chewing time, rumen pH, and milk fat concentration. That response was not alleviated by the addition of alfalfa hay (Zhang et al., 2010). Feeding increasing amounts of wheat DDGS can alter the fatty acid profile of milk fat. There was a linear increase in milk concentrations of CLA cis-9, trans-11, trans-13, C18:1 trans-11, and total CLA, when the level of wheat DDGS increased (Chibisa et al., 2013). In growing lambs, wheat DDGS and triticale DDGS replaced a mixture of barley grain and rapeseed meal at 20% dietary level (DM basis) without adversely affecting DM intake, average daily gain and carcass characteristics. Including triticale DDGS improved the fatty acid profile of subcutaneous fat (McKeown et al., 2010b). In lambs, triticale DDGS replaced up to 60% barley grain without adverse affects on growth performance or carcass traits (McKeown et al., 2010a). In finishing lambs, replacing rapeseed meal and part of the barley grain with 20% (DM basis) of either high-oil maize DDGS, low-oil maize DDGS or wheat DDGS, maintained healthy rumen function, growth performance and carcass characteristics (O'Hara et al., 2011). 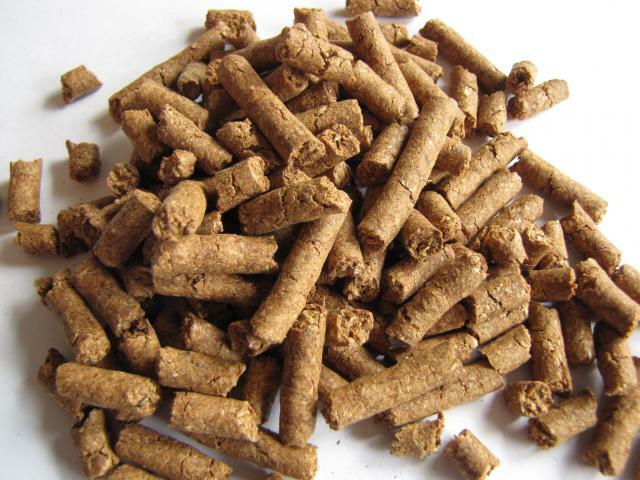 Wheat DDGS is a source of energy and protein for pigs and it can be included at up to 25-30% in diets for finishing pigs and pregnant sows. However, in piglets and, to a lesser extent, in growing pigs, its inclusion at levels higher than 15% may reduce feed intake and growth, especially when the DDGS have a low lysine availability (Thacker, 2006; Widyaratne et al., 2007; Avelar et al., 2010; Newkirk, 2011). In lactating sows, when the objective is to maximize feed intake, it is recommended to use inclusion rates lower than 20%. Generally, as long the nutritional value of the diet is maintained, high inclusion rates of wheat DDGS can maintain performance. Wheat DDGS tends to have lower standardized ileal digestibilities (SID) of amino acids. For most amino acids, wheat DDGS has a SID that is approximately 5 to 10 percentage points lower than in wheat, which is mainly due to the greater concentration of dietary fibre in DDGS than in cereal grains. Lysine SID is particularly low (minus 20 percentage points compared to wheat) and highly variable, with values ranging from 9 to 83% in a survey of 10 European wheat DDGS (Cozannet et al., 2010a). Drying conditions are the probable cause for this low digestibility: the lowest values were observed in dark products with the probable occurrence of Maillard reactions, suggesting that colour might be a quick method for identifying DDGS sources with a poor amino acid digestibility. These data also suggest that dark DDGS with L values below 50 have a low and variable lysine content (relative to the crude protein), together with low and variable lysine SID values, and should not be used in feeds for pigs and other monogastric animals. Due to the lower percentage of phytic acid, phosphorus is more digestible in wheat DDGS than in wheat grain with values ranging from 50 to 60% (vs about 30% in the grain) (Nyachoti et al., 2005; Widyaratne et al., 2007; Yáñez et al., 2010). Unlike maize DDGS, which tends to generate soft fat, wheat DDGS in finishing pig diets does not much affect carcass and fat quality, even when it is fed up to slaughter (Stein et al., 2009). The negative effects of the high dietary fibre content of wheat DDGS on their energy and protein value are expected to be alleviated with the use of enzymes (xylanases, etc. ), which should allow for higher inclusion rates in pig diets (Emiola et al., 2009). An improvement in the homogeneity of wheat DDGS in terms of colour and drying conditions will also allow for higher rates of inclusion. The use of wheat DDGS in poultry feeding only started when this product became available on a large scale in the late 1990s. For poultry feeding, light-coloured wheat DDGS should be preferred to darker ones as their quality is higher (Cromwell et al., 1993; Cozannet et al., 2010b). Wheat DDGS has a high content of crude fibre and cell walls, as well as low digestibility values in poultry, resulting in an increase in nutrient outputs (N and P) when its inclusion rate increases in the diet (Leytem et al., 2008). When diets are well balanced in energy and digestible amino acids, wheat DDGS can be introduced up to 15% in broilers diets without detrimental effects on performance (Thacker et al., 2007). Some studies have shown that these products can be introduced at up to 5-7% without any negative effect (Lukasiewicz et al., 2012). However, considering the variability of wheat DDGS, it is recommended to use safety margins, and thus lower inclusion rates, when the precise composition and digestibility of wheat DDGS are unknown. The use of exogenous enzymes may improve the value of wheat DDGS and allow for higher inclusion rates in poultry diets (Cowieson et al., 2006). Wheat distillers grain was used safely at 20% dietary DM for growing rabbits (Alagón, 2013), and up to 34% in another trial (Molette et al., 2009). Growth rate, feed efficiency and health risks were similar or slightly better for rabbits fed wheat DDGS than for rabbits fed a control diet, depending of the other ingredients, and the overall balance of the diets. However, the improved fatty acid profile (higher percentage of omega-3 fatty acids) in the meat of rabbits fed wheat DDGS compared to that of rabbits fed the control diet was more a consequence of the proportion of other ingredients, such as alfalfa hay, than a consequence of wheat DDGS per se (Molette et al., 2009). The estimated digestible energy content (15.7 MJ/kg DM) of wheat distillers grain is significantly higher than that of maize DDGS and even more so than that of barley DDGS, due to a high energy digestibility (75%) identical to that of protein in this product (Alagón, 2013). The high protein level of wheat DDGS makes it as valuable as many oil meal by-products (for instance sunflower meal) as a source of protein and also as a source of energy and fibre. Nevertheless, it is necessary to take into account the very low level of lysine of wheat DDG protein, which covers only 50% of rabbit requirements, and also the low level of threonine. Limited information is available on feeding wheat DDGS to fish. While wheat DDGS contains more protein than maize DDGS, its low fat and high fibre contents limits its use in salmonids and, therefore, this product is only included at low levels in their diets (Newkirk, 2011). However, several products from the fractionation of wheat DDG have been tested successfully in rainbow trout (Oncorhynchus mykiss). One such product contained more protein (over 40% as fed) and less NDF fibre (22% as fed) than the original material and had a higher energy digestibility (83 vs. 75%) and DM digestibility (79 vs. 66%) (Randall et al., 2010). Another product obtained by aqueous protein extraction that had a higher protein content (69% DM) and a low non-starch polysaccharides content (8% DM) resulted in increased DM, energy and fat digestibilities, and was fed at up to 30% to rainbow trout without affecting growth performance (Reveco et al., 2012). Juveniles of channel catfish (Ictalurus punctatus) were fed 30% wheat DDGS without deleterious effect on survival, growth, feed intake, feed efficiency and protein efficiency. Up to 40% wheat DDGS was fed when juveniles received lysine supplementation. Feeding wheat distillers grain had a positive effect on resistance to the bacteria Edwardsiella ictaluri, which may have been due to the presence of residual yeast contained in distillers grain (ErchaoLi et al., 2012). He, M. L.; Hernandez, L. M.; Aalhus, J. L.;Dugan, M. E. R.; McKinnon, J. J.; Mc Allister T. A., 2012. Inclusion of triticale dried distillers grain and flaxseed in feedlot cattle diets increases alpha-linoleic acid in beef without affecting carcass or meat quality traits. ADSA Meeting, Abstract W285, Phoenix, USA.